Welcome to the Cosmic Animal Subscription Box! Collect 112 artistic cosmic animal guide cards in the mail each month to inspire and guide you. Plus get access to exclusive monthly videos (animal messages, tarot card readings, meditation visions, painting tutorials…) and temporary tattoos. Pull a card each day, hang them up for decoration, or bring them into your meditation practice. Large double sided 4x6 glossy cards with rounded corners. One side features a painting of a cosmic animal and the other side provides written symbolism and guidance. The art for each card was originally hand painted with watercolors in a Galaxy night sky style. All the art and writing was created by Tanya Casteel. $6 – “Tortoise” Cosmic Animal Cards. Receive 1 Cosmic Animal Guide Card in the mail each month. A velvet drawstring bag to collect all 112 guide cards in as they come in the mail. Plus access to all my exclusive monthly videos (new video each month and access to all my past videos). 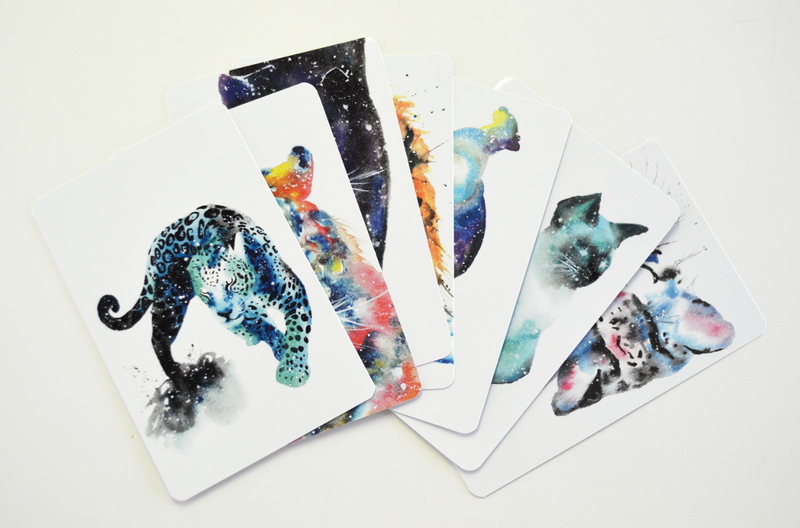 $30 – “Rabbit” Cosmic Animal Cards. Receive a mini-deck of 10 Cosmic Animal Guide Cards in the mail each month! Divided into the 10 categories listed above. A cosmic animal temporary tattoo from my artwork each month. A velvet drawstring bag to collect all 112 guide cards in as they come in the mail. Plus access to all my exclusive monthly videos (new video each month and access to all my past videos). Sign up through my PATREON page (a wonderful site that organizes all of my members for easy shipping and an easy way for you to access your private videos). On my Patreon page, under the rewards panel on the right, choose your subscription level – click “get reward“, and sign up!!! You can adjust your membership through Patreon at any time. On the 1st of every month, you will be charged your subscription fee from your account. Patreon gives a 5-day window to make sure all charges are completed. Your subscription and access to videos won’t start (and you won’t be charged) until the 1st of the following month. After the 5th, your Cosmic Animal Guide Cards will be shipped (and you’ll have access to all the past videos and new ones each month)! Question: How are your Guide Cards (subscription box) different from your Wild Messengers Tarot Cards? 112 guide cards in the subscription box. 80 tarot cards in the deck. They share many of the same animals but some of the animals on the guide cards are different painted versions than the ones that appear in the Wild Messengers Tarot Deck. Guide Cards have symbolic writing on the back for each individual animal. Tarot cards have all the same snakeskin backs. Each guide card has my symbolic animal writing on the back. Tarot cards come with a separate guidebook written by Lola Pickett. None of my writings appear in the tarot guidebook. Our writings complement each other. They are different and similar at the same time – expanding on the depth of animal wisdom. You get access to private videos with the subscription box each month (animal wisdom, painting, and card readings). No videos come with the tarot deck.